That’s right, the Prince of All Cosmos is finally finished! And he’s already off to his new home in Virginia! Hopefully he’ll have a safe journey, and not roll up too many other packages on his way there… 😉 His Ravelry project page is here, for those of you curious for more details and an extra picture. I haven’t forgotten my commission work. 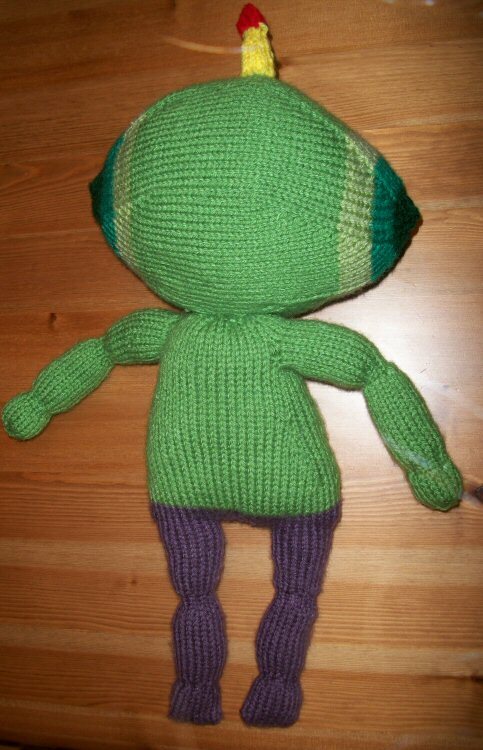 On Monday I finished up all the knitting for the Prince of All Cosmos plushie I’ve been working on for two weeks. All he needs now is a face! I need to get to the craft store and buy myself some felt so I can ship this guy out. He’s a whopping 22 inches tall, from the top of his antenna to the bottom of his feet. I finished making another katamari hat! 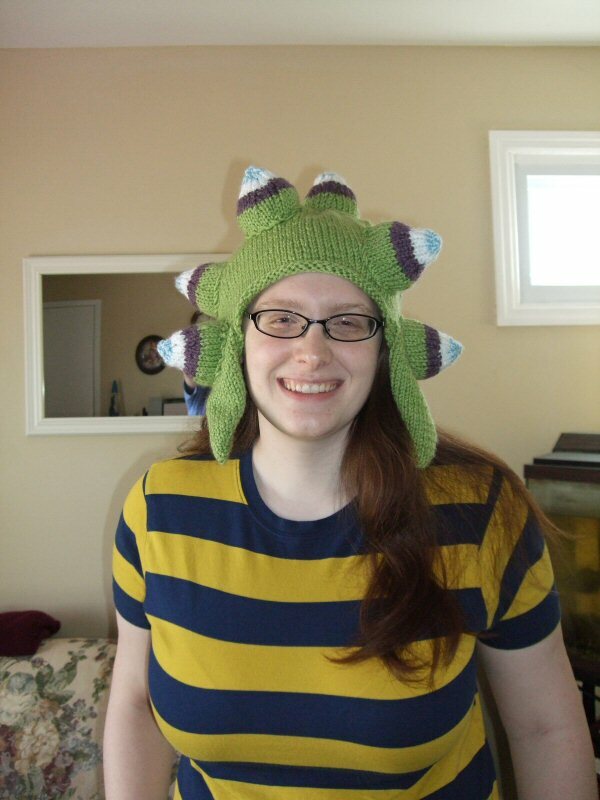 This one is nearly identical to the hat I made for Speed Demos Archive‘s Awesome Games Done Quick. The only difference is that this one has eight bumps instead of seven, which (in my opinion) fills the hat out better. Also, this hat took exactly one skein of Vanna’s Choice Baby yarn, in the colorway Sweet Pea. I think it’s the perfect shade for the green katamari ball! The Ravelry project page for this hat is here. 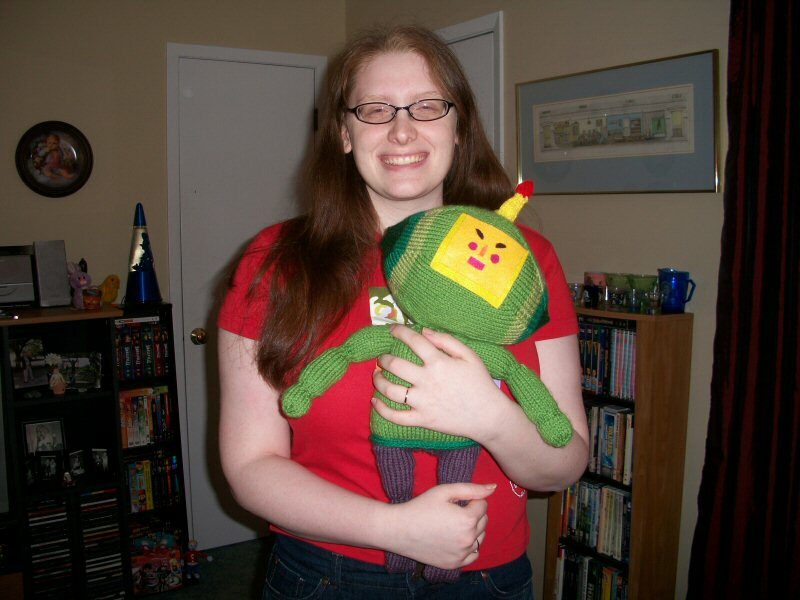 My next project follows the katamari vein–I am going to make the Prince of All Cosmos! But while I am making more progress in my customer queue, I will also be making a few small prizes for SDA’s emergency charity event, Japan Relief Done Quick. Yes, that means you can win some of my plushies for donating at least $5 to charity! I will post more details here about the marathon when things are more firmed up. It will take place April 7 – 10, so save the dates, watch some great speedruns, and help us raise money for Doctors Without Borders as they aid the Japanese people in the aftermath of the earthquakes and tsunami.